If you have read any of my posts, you will know that I am a cosmetics geek. 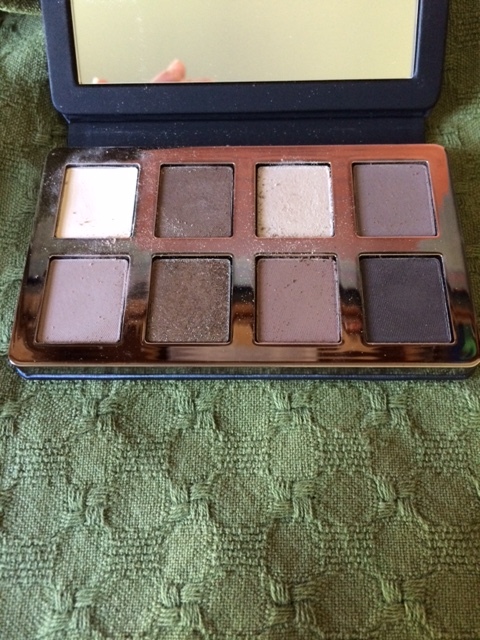 Truly, I used to dream about eye shadow palettes when I was a young girl [which, by the way, is how I realized I dreamed in color!]. I rarely gamble on drug store varieties anymore, however, as I would rather get some advice, try out a product, wear it for a day and then make a choice. I want durability, comfort of wear (read–no skin issues please) and something that is lovely. I also purchase based on potential for creative mix and matching; uses beyond just the obvious, and–I would be lying if I neglected to admit this point–the ambiance of the product. If I can also get longetivity and some sense of organic or fair trade, it is a true winner. The final deal breaker is financial–I can go for the pricier product if I have a discount card, gift card, etc. I have been experimenting this week and am starting to get the hang of the potential in this set of shadows. The powder is very fine and takes a bit of layering to build it up. It has pretty decent staying power. Also, the sparkly shades are mica and are much more subtle than first impressions lead you to believe. Overall, I think I will enjoy this product! How about you–anything new in your stash? What are your conditions or deal breakers when selecting a new cosmetic? Thank you so much! Glad the shadows worked. I love these eyeshadow shades! I have some posted by ELF that you might like- check it out! I’ve been curious about this palette- any chance for swatches?